'Draw Furries' Crew Back with More Art Instruction! Lindsay Cibos and Jared Hodges are the creators of the Ursa Major Award-winning how-to book, Draw Furries. Fresh off that success, they now return with Draw More Furries: How to Create Anthropomorphic Fantasy Creatures, coming this Thanksgiving in paperback from Impact. 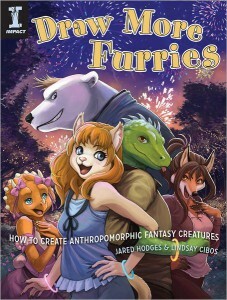 “The authors of Draw Furries bring you more of the best step-by-step lessons for creating anthropomorphic characters. You’ll learn everything from furry anatomy, facial expressions and poses to costumes, coloring and settings! You’ll also learn how to create characters that convey the various personalities and spirits of the animals they resemble. Draw More Furries is packed with 20 new furries, ‘scalies’, and mythological creatures with lessons covering everything from drawing mouths and muzzles to paws, feathers and fur. The anthropomorphic creatures you can create with these easy-to-learn lessons are limitless!” Pre-order it at Barnes & Noble. But... isn't the proper way to just be skilled at drawing EVERYTHING? If you can draw a car, you can draw a bus. If you can draw a man, and a cat, you can draw a cat man. I am speaking as an arghtist now. I remember flipping through the first vol in the book store and it was broken anatomy, broken anatomy everywhere.